There has never been a greater need to develop renewable energy generation systems, plus there is pressure to get such systems on stream quickly. Jon Severn looks modelling, simulation and testing technologies used in the development of renewable energy systems. Renewable energy remains a growth area despite the global recession reducing general demand for energy and prices being considerably lower than when they peaked. While some organisations may have cut back on their research into and development of renewable energies, others remain very active. Compared with conventional power generation systems, those using renewable technologies are far from being mature, which means that successful research and development can be extremely rewarding. And not only is it a matter of refining existing technologies, but there are some areas - such as solar power - where it is thought that new technologies could deliver a step change in the cost-per-watt for the power generated. In common with virtually all fields of engineering design today, the trend is towards more digital prototyping and computer-based evaluation and testing before a commitment is made to time-consuming and expensive production of either scale models or full-size physical prototypes of components or systems. Nevertheless, there inevitably comes a point when physical tests are necessary, so the emphasis today is on using digital technologies to streamline the testing to minimise the time required for testing and subsequent data analysis. One of the companies at the forefront of digital modelling and testing is National Instruments. Having progressed from its roots in virtual instrumentation, this company now has powerful software for modelling, simulation and control. 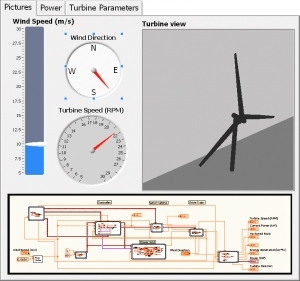 For example, National Instruments Labview and the Labview Control Design and Simulation Module can be used to simulate a full wind turbine system, including the turbine, mechanical drive train, generator, power grid and controller. The Control Design and Simulation Module provides a numerical simulation environment that enables users to test the model, and the Control Design and Simulation Module can be used to analyse the interactions between hybrid mechanical-electrical systems (Fig. 1). Furthermore, the quality of existing models can be improved and other control strategies can be investigated by simulating deep-bar induction generators and more complex models of drive trains. A good example of National Instruments Labview being used in the physical testing of full-size components is the project undertaken by Erik R. Jorgensen et al, of the Riso National Laboratory, Roskilde, Denmark, (Full scale testing of wind turbine blade to failure - flapwise loading). In this project a 25m long wind turbine blade was tested to destruction at three points along the blade. Acoustic emission (AE) sensing was used to detect damage (such as cracking, deformation, debonding or delamination), with a PAC (Physical Acoustic Corporation) R15I sensor that incorporates an integral preamplifier. A customised system developed by Demex and the Riso National Laboratory using Labview virtual instruments and based on a high-speed data card digitised the entire AE signal waveform detected on four channels. A PAC Spartan AT system recorded the waveform characteristics of each detected AE signal (amplitude, rise-time, energy, etc) on two channels. This test method enabled the onset of 'macro-damage' to be identified and also the 'precursor micro-damage' that cannot subsequently be detected using conventional non-destructive testing techniques. The Labview system used a time-of-flight virtual instrument that highlighted how AE events, even those emitted at relatively low load levels, clustered around the eventual failure points. Launched in 2009, the Fraunhofer Institute for Wind Energy and Energy System Technology (IWES) serves the wind energy industry, with areas of research and development ranging from materials to integration within the power grid. 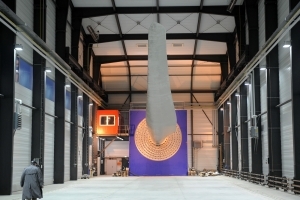 Although the IWES is a new organisation, the researchers already have two years' experience in developing testing methods for wind energy systems: the CWMT, which has merged into the IWES, has specialised in oversized material tests, making use of a specially constructed building 85 m long and 25 m high for testing rotor blades (Fig. 2). Meanwhile, National Instruments has been involved in a project to develop a test system for use on wind turbines operating in the field. Energy To Quality SL (E2Q) has trailer-mounted equipment that generates short circuits in medium-voltage networks by using a voltage divider to actuate a circuit-breaker. Due to the requirements of a new customer and the need for an easy-to-use interface, E2Q developed a voltage dip generator that is controlled by a National Instruments PXI-1052 chassis. The customer had requested additional controls over and above what E2Q already offered, such as a circuit breaker that generates the voltage dip and closes on a specific value of the voltage phase. The closing angle determines the behaviour of the power electronics converter installed in the wind turbine. E2Q therefore built a system based on the PXI-1052, a four-slot PXI chassis with eight slots for SCXI modules, so inputs could be made at higher levels than with a standard PXI system. To overcome the high power consumption of the tripping coils, the digital outputs controlling the breakers interface with a programmable digital protection relay designed to control medium-voltage elements. Digital outputs from the PXI connect to digital inputs on the relay. When the protection relay is activated, the protection functions can be removed from the control system, leaving computation power for estimating the phase angle. Labview was used to optimise the performance of the system, with the program running on a computer located at a safe distance from the trailer-mounted test equipment, communicating with the PXI chassis using the TCP protocol. The chassis transmits the states of the circuit breakers and executes the user's commands. If the communication link is lost or the application crashes, the system ensures that all the switches and circuit breakers are in a safe state. The design of the new user interface makes for easy operation of the voltage dip generator. Each switch or circuit-breaker can be operated by pushing the open or close button; undesired operations are prevented automatically by means of programmed interlocking functions. To generate voltage dips, the operator can set different parameters such as the duration, the active power range, the reactive power range and the phase angle. Once the sequence is started, the system waits for the defined conditions to be met before closing and opening the circuit breaker. Active and reactive powers and phase angle are computed in real time by a special algorithm. Closing very accurately on a specific phase angle requires a relatively high sampling rate (several kilohertz). While wind turbines can be useful for relatively large-scale generation of electricity, fuel cells offer potential for portable devices, vehicles and equipment in remote locations. National Instruments' computer-based measurement products are helping scientists and engineers in research, design, validation and production testing of fuel cells. In research and development applications, fuel cell testing is performed to characterise and optimise energy output as well as to extend the life and robustness of the fuel cell stacks. In validation, the main goal is to optimise the design in preparation for mass production, and to reduce the overall cost of the stack without reducing the efficiency. For manufacturing applications, the stacks are monitored to ensure that they meet the design specifications. Scientists and engineers researching, developing or manufacturing fuel cells need a variety of measurement, control, analysis and visualisation tools to evaluate and validate fuel cell technologies. Fuel cell test systems need accurate monitoring and control of hundreds of measurements ranging from the flow, temperature, pressure and humidity of the hydrogen fuel to the output voltage and current of the fuel cell stack. Test systems must be able to monitor and control fuel cell operation under widely varying conditions and accurately capture information relating to real-time performance and operational characteristics. Test systems must also provide flexible data acquisition, monitoring and control capability to control fuel cell operation and experiments. The Labview Datalogging and Supervisory Control Module meets the needs of fuel cell researchers and testers thanks to its built-in high-channel-count data acquisition, data logging, interface and security capabilities. Fuel cell test systems may require hundreds of data acquisition sensors and controls for temperature, humidity, atmospheric pressure, oxygen and other parameters. A typical test may involve increasing a parameter such as temperature to a certain point, holding it steady and graphing the resulting voltage and current across the fuel cell. The Labview Datalogging and Supervisory Control module includes an extensive historical database in which all measurement and test data acquired can be saved for later review and correlation with Diadem, National Instruments' software for technical data management that enables users to load test data and perform interactive offline analysis and then generate reports. Fuel cells are attractive to designers of electric vehicles, but so too are battery storage systems. 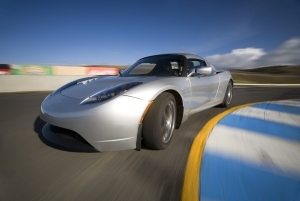 Model-based design tools were used by Tesla Motors when it developed the Tesla Roadster, which the company describes as the world's first electric production sports car (Fig. 3). To meet aggressive technology goals on a strict budget and timeline, the design team relied on Simulink and Matlab from The Mathworks to model the entire vehicle and its major subsystems. Engineers combined individual models for each major system of the car - including the motor, battery, transmission, brakes, tyres, power electronics and control systems - into one full-system model for simulating and predicting overall vehicle performance. These results were then compared against results obtained from prototype vehicles to refine the full-system model. Mathworks model-based design tools have also been used by Dongfeng Electric Vehicle (DFEV), a research and development arm of Chinese automotive manufacturer Dongfeng Motor Company. DFEV undertook a project to develop a battery management system within 18 months; it is now installed in Dongfeng's EQ6110 hybrid electric city bus, which delivers 30 per cent better fuel efficiency and lower emissions than standard city buses (Fig. 4). Faced with the challenge of developing a battery management system in 18 months, the six-person DFEV engineering team determined that it needed to eliminate the debugging and maintenance effort of traditional hand-coding implementations. The team developed models of the controller and battery using test data, both in Simulink. Engineers then performed simulations and used rapid control prototyping to run the control algorithm against a real battery before generating production code using Real-Time Workshop Embedded Coder for the target ECU. Tools for model-based design helped the team model, verify and generate all the application code for the battery management system within a single environment. Furthermore, the DFEV engineers are now reusing the controller design for a hybrid electric car that is currently in development. When engineers from Daimler (formerly DaimlerChrysler) started a user trial of 100 hydrogen fuel cell vehicles in Japan, Singapore, USA, Europe, China and Australia they needed a way to process the vast amounts of data that would be collected for the vehicles' performance and usage patterns. This data included information relating to the level in the fuel tank, vehicle speed, the position of the accelerator pedal and location data from an onboard GPS device. By converting the millions of drive files into Matlab-based reports and web applications, the engineers were able to understand the vehicle usage patterns, track fuel consumption, understand how driving patterns affect vehicle performance, and start planning a hydrogen refuelling infrastructure. Daimler's engineers use Matlab and the Database Toolbox to query the central database and retrieve odometer and GPS data. A specially written Matlab script filters out anomalous data, such as zero points reported by the GPS system and non-drive files. The script then processes all the data, generating a plot that sums distance travelled by time period and geographic region. Previously Daimler used Microsoft Excel to perform the analysis, but this required hundreds of hours to set up, a full-time employee to maintain, and many manual steps had to be completed each time. In contrast, the automated Matlab script lets the team access the results via a Web browser. Using a tool that was developed with Matlab and the Mapping Toolbox, Daimler's engineers can also reconstruct any test vehicle journey. The engineers can therefore track the fuel tank state of charge (SOC) on a satellite geographic map, making use of a script that produces Keyhole Markup Language (KML) files for use with Google Earth - which offers greater flexibility than static Jpeg graphics. By correlating the pedal position data with the telematics data, the engineers found interesting differences in driving styles between geographical regions: in Germany the engineers saw frequent high-speed highway driving, where the pedal is pushed all the way down; in Singapore, people are seen to drive more slowly and smoothly, with the pedal seldom pushed down more than 40 per cent of its travel. Understanding these trends will enable the engineers to customise control strategies for different regions. Something else that the engineers have found is that the high quality of the analysis and reports that they can produce in Matlab has resulted in other team members and managers asking them further questions to gain even better insight. And engineers have found they can respond quickly and easily by working solely within Matlab. So far we have discussed a variety of renewable energies, but two that are often overlooked are wave and tidal power - sometimes referred to collectively as marine power. These technologies have been described as lagging 20 years behind wind power, though commentators have recently expressed the view that marine power technologies could catch up with wind power technologies in as little as ten or even five years. And the incentive certainly exists: tidal power, in particular, offers an advantage over wind power in that tidal flows are guaranteed, throughout the year, in all weather conditions. One of the drawbacks with marine power technologies, however, is the difficulties and costs associated with testing prototypes. But now the University of Manchester, in the UK, has opened a combined wave and tidal flume that can be hired by firms looking to conduct physical tests on nearshore structures or renewable energy devices (Fig. 5). Designed specifically for shallow hydraulic flows such as those found in coastal regions, the Joule Centre Wave Flume allows realistic nearshore wave and current conditions to be simulated, which makes it particularly well suited to the evaluation of marine power device performance and environmental impact. Waves in the 20 m long facility are provided by eight piston-type wave paddles that can create regular, random, directionally spread or grouped wave conditions. Current velocities up to 0.5 m/s at 0.45 m depth are achievable and currents can be generated simultaneously with any wave condition - which is a feature that is claimed to be unique. The programmable paddles and 5 m width of the flume ensure that repeatable tests can be conducted without significant influence from the side walls. The flume can also be tilted by up to 10 degrees from the horizontal, which will be of interest to companies needing to test shoreline or estuarine structures. Key considerations for those developing marine energy technologies are their power output, survivability and environmental impact, all of which are crucial to the economic viability of this emerging industry sector. Previous experiments using the flume have helped to address such challenges. For example, researchers developing a wave device comprising an array of vertically oscillating floats known as the Manchester Bobber have used the flume to improve their understanding of performance of an array of devices, as little is known about this for any type of wave energy device. The experiments enabled the team to optimise the device's float-shape as well as study arrays of tidal stream devices to understand the effect of energy extraction on the natural flow. Supported on three gantries, the instrumentation includes capacitance wave probes and velocimeters, as well as high-speed video cameras. The instrumentation is linked to a PC interface for remote monitoring and data-logging, and a Perspex basin is provided for easy visualisation from both above and below.